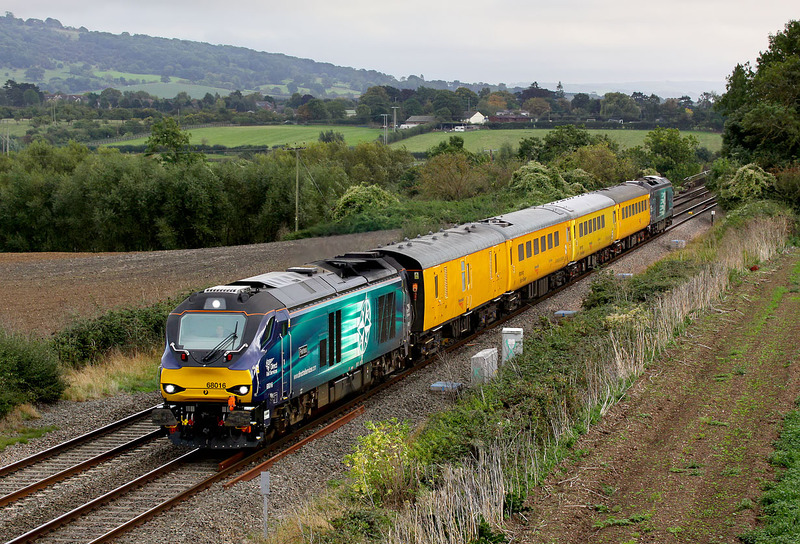 68016 Fearless passes Defford on 28 September 2016 with the 1Q16 03:29 Landore to Derby RTC Network Rail test train, with classmate 68021 Tireless bringing up the rear. The train had spent the early morning visiting the western extremities of the Welsh railway network, including: Pembroke, Fishguard Harbour and Milford Haven. Although the sun was out for most of the time as I drove to this location, and similarly on my way home, unfortunately when this train passed there was no sign of the sun, and it was extremely dark.